1st floating nuclear power plant unveiled by Russia. Russia has recently unveiled the world's first floating nuclear power station in the port of the far northern city of Murmansk. 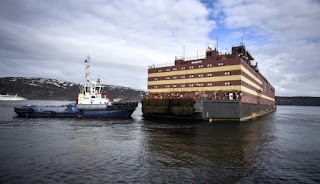 It will be loaded with nuclear fuel at Murmansk and will be towed to port of Pevek in autonomous Chukotka region in Russia’s far northeast in Arctic Circle region. Akademik Lomonosov is constructed by the state nuclear power firm Rosatom. It is a 144 by 30 meter ship which holds two reactors with two 35 megawatt nuclear reactors. It has displacement of 21,500 tonnes and crew of 69 people. The barge can produce enough electricity to power a town of 2,00,000 residents. It has latest security systems and is considered as one of safest nuclear installations in the world.